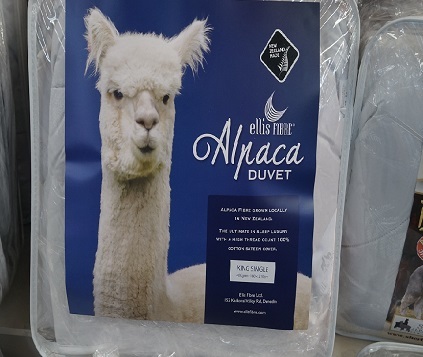 The Alpaca Duvet is a wonderfully warm and cosy duvet for excellent year round comfort. This hypoallergenic duvet has extremely good insulating properties for warmth (400gsm Alpaca Duvet inner compares to a 500gsm wool duvet in warmth) yet is light weight (25% lighter than wool). Furthermore, the Alpaca fibres also have the highest moisture wicking properties of all natural fibres. The fibres contain microscopic air pockets which trap air and also release moisture to the outside of the duvet into the air creating a duvet with odour and mildew resistance, while retaining warmth. The Alpaca Duvet comes in a range of sizes to suit every bed from baby's cot to Super King. Please ask about the price.